I've been swooning over more delicate jewelry lately. I was simply delighted to discover Boutique Minimaliste. She has a ton of great dainty pieces from bracelets to necklaces. All of them were my favorites but what caught most of my attention was this navy & anchor beaded bracelet. The shop is located in Portugal. For US orders, shipping only takes 4-5 business days. 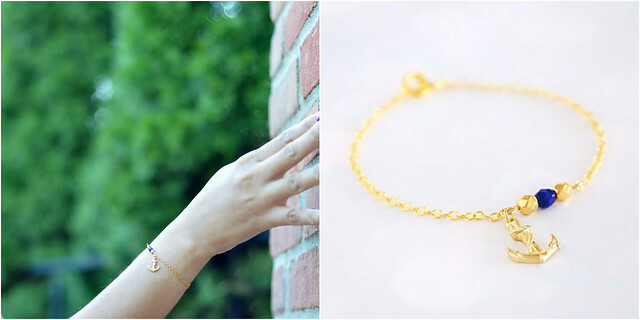 If you're looking for a piece of jewelry for everyday wear, her shop is worth checking out! that bracelet is so perfect! i am getting into dainty pieces too - found a really cute dainty skull necklace in a hawaiian boutique hehe. btw i'm moving in on friday! i'm really excited :) hopefully we can meet up again and this time i'll have a car so we can avoid last time's debacle..
ohhh i loveee your new bracelet!! especially the bright pop of royal blue! so pretty!! I love your anchor bracelet! OOO I love the anchor bracelet. Thank you for introducing us to a new shop. @Angie I am excited that you're finally moving in. We definitely will get together again (hopefully before life gets too busy with the little one). oh my gosh, i need that anchor bracelet! yes i said need!! They are so beautiful. I love that heart bracelet. Happy to know a new shop! Very cute! I love the tangerine bracelet! That anchor bracelet is gorge! For me bracelet is little more than just a piece of jewelry. It is not only a form of self-expression, but also what makes you look fashionable. This anchor bracelet is awesomely cool.